Trace and trim around this shaving guide for a clean hair and beard line. 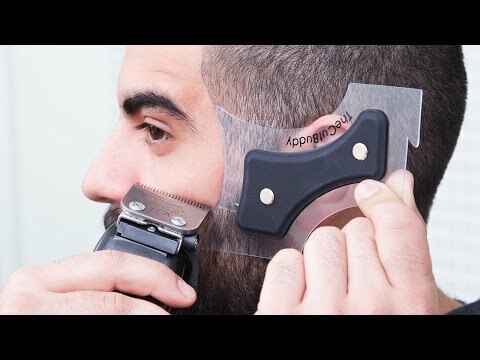 It’s a grooming stencil that will help you look sharp between barber visits, while you travel, or at home. The guide also comes with a pencil in case you want to trace, then line up using a clipper, edger, or razor. The Cut Buddy proves that in any given situation, looking sharp means feeling sharp. Dimensions: 4" x 6" x 0.5"
Using just my eye to keep the sideburns and beard straight wasn't working for me anymore. This helps! Nope doesn’t work like it says because it isn’t easy to see. Another thing for the junk drawer. Trace and trim around this shaving guide for a clean, professional-caliber hair and beard line. Whether you use this grooming stencil in between barber visits or skip them altogether, The Cut Buddy makes it easy to self-groom. So easy that a 13-year-old could do it. In fact, now-grown-up Joshua Esnard made his first template when he was only 13. With no barber for a 30-mile radius, he hacked a way to edge up quickly. The result was a clean, easy shave, but the implications far outgrew his well-defined trim. Joshua felt as good as he looked. He had more courage to ask girls out, and strut into job interviews. From soldiers in far-away posts to avid DIY-ers, The Cut Buddy makes it easy to get a beautifully-curved, symmetrical hairline.